A powerfully written firsthand account of the human costs of conflict. J. Kael Weston spent seven years on the ground in Iraq and Afghanistan working for the U.S. State Department in some of the most dangerous frontline locations. Upon his return home, while traveling the country to pay respect to the dead and wounded, he asked himself: When will these wars end? How will they be remembered and memorialized? What lessons can we learn from them? These are questions with no quick answers, but perhaps ones that might lead to a shared reckoning worthy of the sacrifices of those—troops and civilians alike—whose lives have been changed by more than a decade and a half of war. Weston takes us from Twentynine Palms in California to Fallujah in Iraq, Khost and Helmand in Afghanistan, Maryland, Colorado, Wyoming, and New York City, as well as to out-of-the-way places in Iowa and Texas. We meet generals, corporals and captains, senators and ambassadors, NATO allies, Iraqi truck drivers, city councils, imams and mullahs, Afghan schoolteachers, madrassa and college students, former Taliban fighters and ex-Guantánamo prison detainees, a torture victim, SEAL and Delta Force teams, and many Marines. The overall frame for the book, from which the title is taken, centers on soldiers who have received a grievous wound to the face. There is a moment during their recovery when they must look upon their reconstructed appearance for the first time. 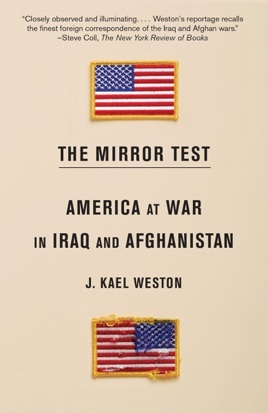 This is known as “the mirror test.” From an intricate tapestry of voices and stories—Iraqi, Afghan, and American—Weston delivers a larger mirror test for our nation in its global role. An unflinching and deep examination of the interplay between warfare and diplomacy, this is an essential book—a crucial look at America now, how it is viewed in the world and how the nation views itself.